BodySculpting is now available in Windsor with SculpSure at Revitalize. If you’ve tried everything to slim your waistline there is a new treatment that can help sculpt your body. SculpSure is a non-invasive laser fat reduction treatment that can reduce stubborn fat without the need for surgery or painful side effects. With no downtime and as quick as a 25-minute procedure, it has never been easier to get the body you’ve always wanted! 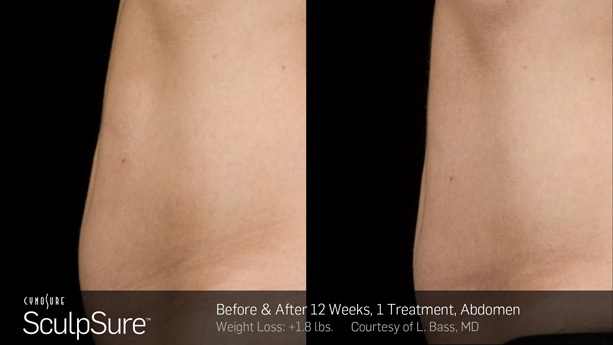 Look through our before and after gallery to see real patients’ results from SculpSure treatments. 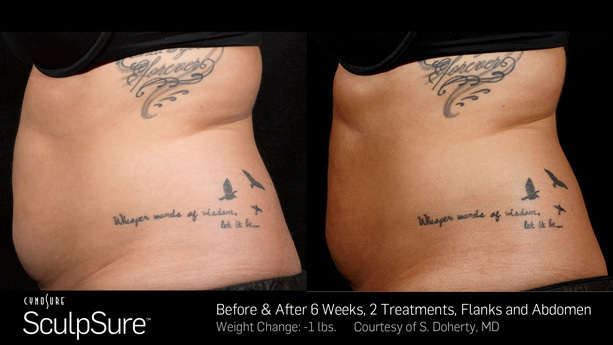 Laser body contouring is a non-invasive way to reduce stubborn fat* and love your curves! Contact us today to learn more about slimming down with SculpSure. Each SculpSure laser body contouring procedure lasts less than 30 minutes. Depending on your goals, more than one treatment may be recommended to achieve your desired results. Patients often experience a slight tingling sensation during the procedure, but it is not usually considered painful. The treatment has few side effects including some mild tenderness, swelling, and redness. No downtime is needed, so patients may return to their normal activities immediately following the procedure. 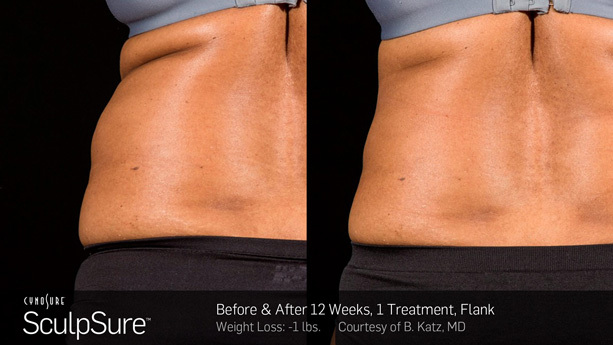 While many people start to see results as early as 6 weeks following SculpSure fat reduction, the best results are usually experienced after 12 weeks*. Reading about these 2 procedures on this site can quickly become overwhelming when trying to decide between these body contouring devices. The surgeons with Coolsculpting will say that their machine is the best, and vice versa, surgeons with Sculpsure will say that theirs is. Our team will give you some of my own personal thoughts and observations. As a team of professionals our team, did quite a bit of research on both procedures prior to deciding to offer Sculpsure over Coolsculpting. I will try to outline the similarities and differences in hopes of helping you to make the best personal decision. both machines permanently destroy fat cells. 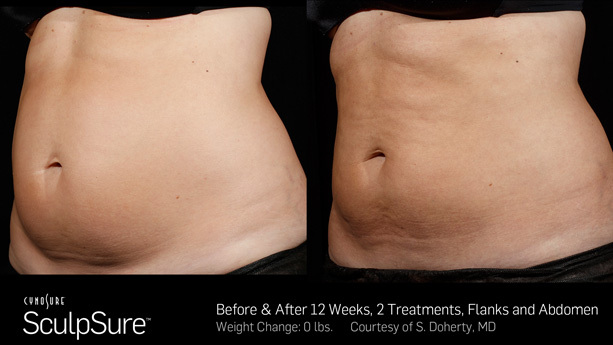 Sculpsure is 25 minutes for one area, Coolsculpting is 50 minutes. One of the physicians below brought up that the Sculpsure treatment heads are smaller and therefore do not save time. Its not the size of the applicator that matters, its what areas you can treat in those 25 minutes. 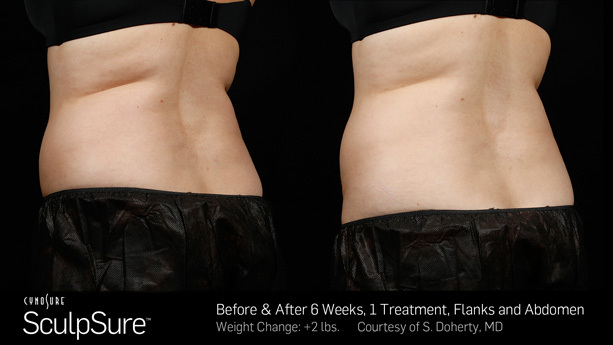 Take the flanks (love handles) as an example- you can treat both flanks in one 25 minute session with Sculpsure. Because of the design of Coolsculpting, you would have to treat each flank separately at 50 minutes each. So, 25 minutes vs 100 minutes. Which would you rather do? You can literally get up from your Sculpsure treatment and go right to the gym. Zero downtime. As mentioned, I worked a full day right after mine. After Coolsculpting, massaging the “frozen stick of butter” is required. You can read stories on this site from patients who experienced significant swelling and bruising after Coolsculpting, keeping them from returning to their normal activities. Not uncommon after Coolsculpting, sometimes requiring narcotics or neuropathic pain medications such as Neurontin. (there are many patient stories about Coolsculpting pain on this site). I personally had 2 areas treated with SculpSure in the morning and saw patients for the rest of the day. For the next week, I felt like I had done a vigorous abdominal workout. Not pain, just sore. Coolsculpting uses a suction applicator. Anything that gets sucked in gets frozen, including nerves. This causes numbness in the treated areas. In most patients this resolves with time, but can prove an inconvenience. Sculpsure uses laser energy at 1060nm and only targets fat cells. Nerves, vessels, and skin are not affected. Because of the suction applicator, some patients see a sharp demarcation from the treated and untreated areas with Coolsculpting. This leaves and area that many people say looks like a shark took a bit out of their tissue. Sculpsure uses an applicator head that sits on top of the skin and does not use suction. The heat from the laser spreads out beyond the applicator head to allow for better blending between treated and non treated areas. SculpSure is the latest development in fat reduction treatments that use laser light technology to precisely target areas that are resistant to diet and exercise. It is noninvasive, requires no anesthesia and the total treatment time is 25 minutes. An average of 24% of fat is destroyed through the application of heat which is directed only at the fatty tissue beneath the outer layer of skin. Yes, SculpSure is very safe as it requires no anesthesia, does not require an incision or an injection and is safe for all skin types. The FDA has approved the use this specific wavelength of laser energy to break down fat in the abdomen and flanks. It is also safely used ‘off label’ to treat other areas of stubborn fat including the thighs, upper arms and knees. 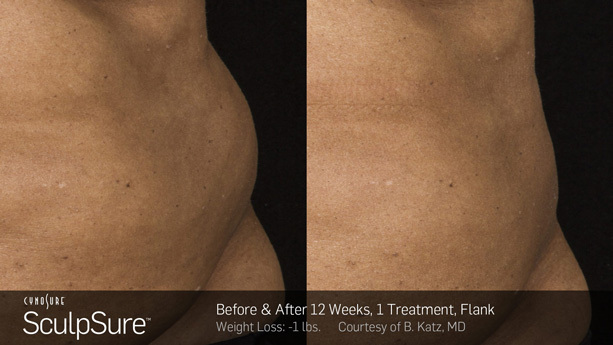 SculpSure safely eliminates bulging fat pads which ruin an otherwise aesthetic silhouette. The wavelength of the laser light from a SculpSure device is particularly attracted to fat cells. The cells beneath the outer layer of skin absorb the heat and are destroyed. The outer layer of skin is not affected and remains completely comfortable during treatment. Over the following months, the destroyed cells are eliminated from the body through the lymphatic system. What can I expect during a SculpSure session? You can schedule your treatment over your lunch break or at any convenient time during your day since you can return to your normal activities immediately following the 25 minute treatment. There is a cooling layer on each device which will activate immediately when the device is turned on. You will feel a cooling sensation throughout the treatment along with intervals of tingling or deep warmth. This indicates that the treatment is targeting the fat as expected. When can I see results of a SculpSure treatment? Many patients begin to see results in about 6 weeks following treatment with continued improvement over the following 6 weeks. Since the body is eliminating the destroyed fat cells through normal lymphatic cleansing action, you will gradually see improvement in the mirror and feel improvement in the fit of your clothes depending on how quickly your body eliminates the fat cells. The best candidates for SculpSure are those who are within 10 to 15 pounds of their ideal weight. Patients who have more weight to lose can discuss more effective options. Patients with visible fat deposits that are not responding to diet and exercise will obtain the best result from SculpSure. Those with saddlebags, love handles, pouches of fat in the abdomen, knees or other areas will enjoy a noticeable improvement using this breakthrough laser light technology. Most patients need only one SculpSure treatment to rid themselves of stubborn fat bulges. If desired, a second treatment can be scheduled in 2 to 3 months. We will discuss your treatment options once he understands what your goals are and how quickly you want to achieve them. SculpSure is a very versatile method of targeting pockets of fat and can be the answer to years of frustration trying to attain an elusive image goal. What is the difference between SculpSure and CoolSculpting™? 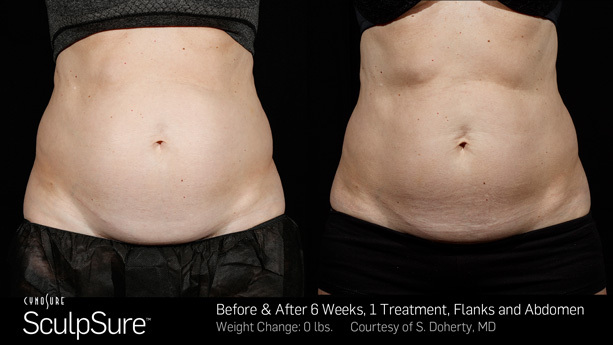 SculpSure uses heat to destroy fat cells, while CoolSculpting freezes the fat. One major benefit for SculpSure is in the speed of treatment; CoolSculpting takes over an hour per area while a SculpSure treatment is 25 minutes. The suction applicator for CoolSculpting is uncomfortable for some people and the required massage after treatment is not always well tolerated. SculpSure has 4 independent applicators that can be configured in many ways to accommodate patient needs. CoolSculpting has applicators that restrict their use in certain areas and as they are not independent, several treatments may be needed to treat an area that SculpSure applicators can treat simultaneously.